2013 Topps Triple Threads Football comes on strong with some major design changes, almost all of them for the better. From the etched gold foil under sticker autographs to make their appearance more regal, to the use of three circle swatches that almost mimic the much higher end Five Star line, collectors will appreciate these cards. Of course, the iconic die cut sayings that overlay the relic pieces still remain for some of the cards, because it just wouldn’t be Triple Threads without it. Topps Triple Threads Football fits into our premium cards category. Each master box has two mini boxes. 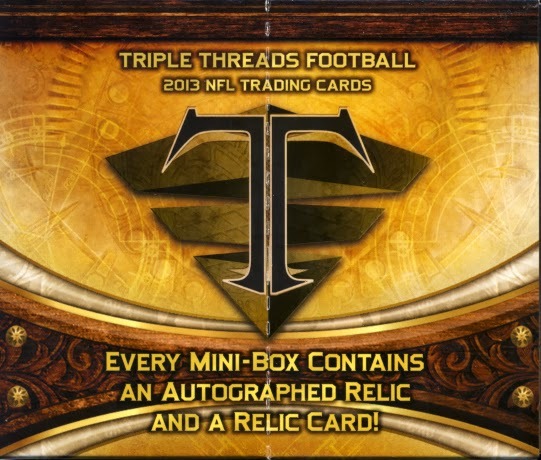 Each mini box contains 7 cards with a low numbered autographed triple relic and a low numbered triple relic card.